For other people named Adam Müller, see Adam Müller (disambiguation). His position in political economy is defined by his strong opposition to Adam Smith's system of materialistic-liberal (so-called classical) political economy, or the so-called industry system. He censures Smith as presenting a one-sidedly material and individualistic conception of society, and as being too exclusively English in his views. 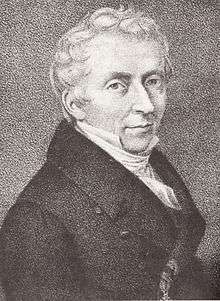 Müller is thus also an adversary of free trade. In contrast with the economical individualism of Adam Smith, he emphasizes the ethical element in national economy, the duty of the state toward the individual, and the religious basis which is also necessary in this field. Müller's importance in the history of political economy is acknowledged even by the opponents of his religious and political point of view. His reaction against Adam Smith, says Roscher (Geschichte der National-Ökonomik, p. 763), "is not blind or hostile, but is important, and often truly helpful." Some of his ideas, freed from much of their alloy, are reproduced in the writings of the historical school of German economists. 1 2 Schmitt, Carl (2011). Political Romanticism. tr. Guy Oakes. Transaction. pp. 42–44. ISBN 9781412814720. ↑ Schmitt, Carl (2011). Political Romanticism. tr. Guy Oakes. Transaction. p. 141. ISBN 9781412814720. This article incorporates text from a publication now in the public domain: Herbermann, Charles, ed. (1913). "Adam Heinrich Müller". Catholic Encyclopedia. New York: Robert Appleton.